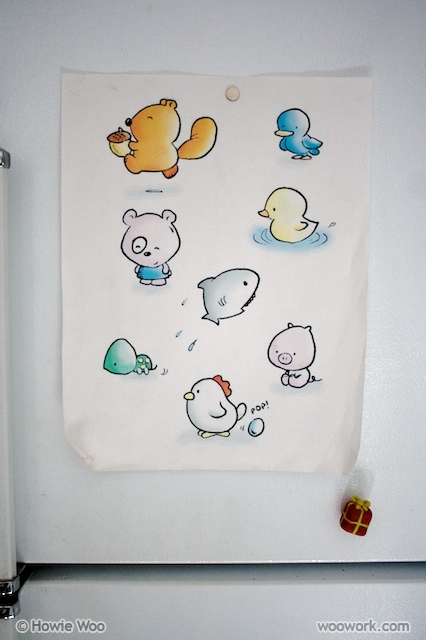 From a drawing on my fridge, the yellow duckling is the forth Fridge Critter to come to life in crochet form. She would be happy to spend all summer in the park's pond. She does wish that swan was nicer to the ducks. 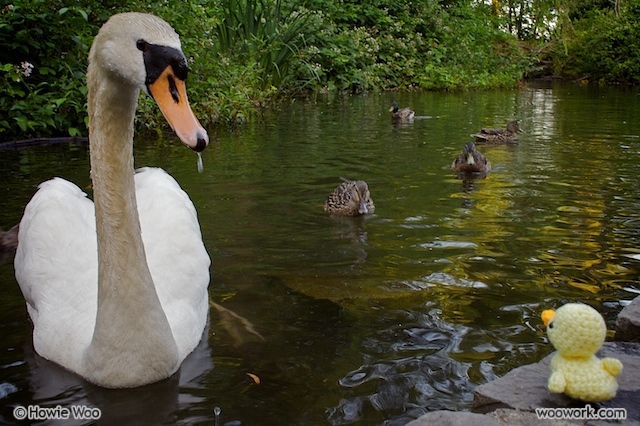 Last week, after barging through the pond like it was king, the swan glared at Darla: "Know your place, ugly duckling." And sometimes Darla imagines twisting that swan's neck into a big ol' knot until he swims away forever. But then Darla's heart beats fast, and she takes a deep breath. After all, it is summer, the water is warm, and the dark thoughts can wait. 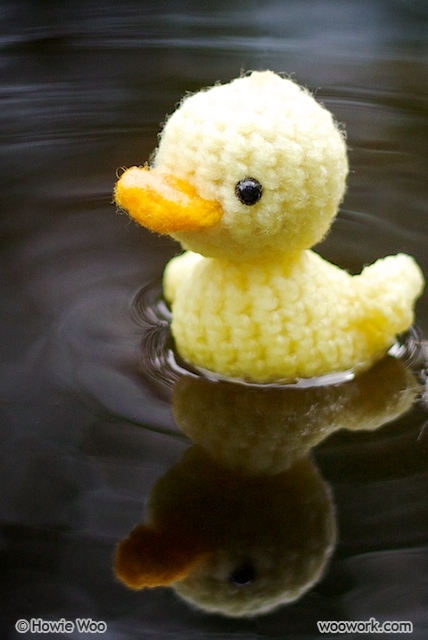 Especially for a duckling named Darla. Sweet! You have GOT to make these patterns available! I LOVE how you post them! How adorable!! Oh my gosh she has the most perfect bill in the world! How did you manage to make it keep its shape? Love the neck knot - haha! Poor little Darla... she will grow up oneday and then watch out swan bully! Yeah swans are mean! They often fool people with their graceful long necks, but they are up to no good. She's so cute! I don't like that swan either! Lording it over those poor ducks, just trying to get their next meal! Another job well done. OMG! This one is my favorite so far! I'm dying for the patterns!! Your work is absolute perfection. Darla is SO cute. Amazing job, as always! Seeing your new ami's and reading their stories is the highlight of my week!!! 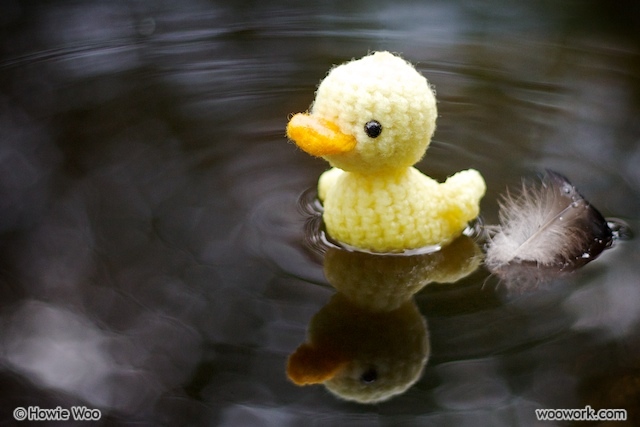 Darla, I'm proud of you for being the bigger person/duck! Ah, the animal kingdom. Much like ours, it's full of bullies. Jana: Thanks :) I'm studying how crochet magazines arrange patterns & photos on a page too! Shelly: For Darla's bill, I kept it as light as possible by not stuffing the bill. When I stitch on potentially-flimsy pieces, I'll often pull the yarn through to the other end of the body, to be extra secure :) Thanks! 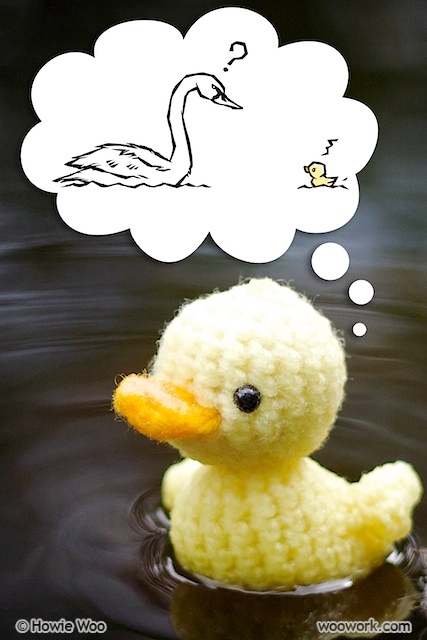 PaisleyJade: hehe Yes, I wonder if Darla will grow up to enact knot-tying fury on that swan? Simply EC: Yes, it's up to your friend, Swan, to reverse the meany-head reputation of all swans! hehe Thanks for writing. TADA's Revolution: Thanks for the compliment, especially since I swoon over each new story from your blog! Also. Your mad ami skillz are enviable! OMG!! Howie! You're sooooo good making amigurumis come true from a drawing that I'm starting to believe that you're more than an artist... a magician!! I really, really, really....really LOVE your work!! Your projects just keep getting better!! I feel very lucky to have the oportunity to enjoy them -your magic tricks :)-, at least here in your blog. Danielle: Yes, sharks are always the highlight of nature documentaries, especially in slo-motion! Thanks! DannyFlo: Wow, too kind, thank you! When I was a little boy, I wanted to be a magician. And I used to mystify my niece with magic tricks, though now she just rolls her eyes. I'm far from a magician now, but I'm lucky to receive your encouragement, thanks! YAY for Darla!! Another magnificently clever & CUTE creation by Howie!! Awesome!!! Thanks for stopping by Dabbled and the nice comments on my illustration, too. I really like this series. By the way, I included this in yesterday's link post at dabbled.org..
And i notice you are one of my blog followers. Make sure you update your RSS feed to http://feeds.feedburner.com/Dabbled - apparently we lost some of the feeds in the move to wordpress. Dot: Thanks for the kind words and for the mention on your arty, crafty, foody blog at Dabbled.org! How did you get Darla to float like that? Or is that a trick? hat to those who can, lol. WOW, IS SO CUTE AND DANGEROUS!!! WOW! 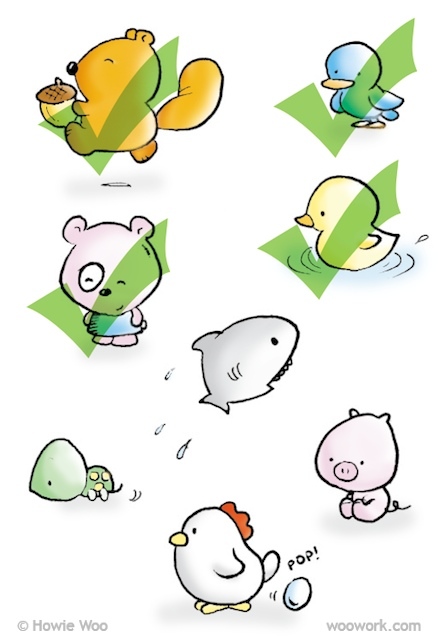 IS SO CUTE AND DANGEROUS!!!! Every so often, like every 5 years, I come back and read a post of yours. Your posts, your writing remains charming and funny. I really enjoy your work. I love her! Tiny but fierce.